Noŋgirrŋa Marawili is one of the leading artists working today, widely recognised for her roughly hewn works and unique vision of country. She is central to the strong group of female artists who have come to the fore in Yirrkala in recent years. Over past years there has been a continual reduction of imagery in Marawili’s works and restraint in retaining bold areas of background painting, The Gallery has acquired an exceptional body of works by Marawili in recent years which would be complemented by this work to comprehensively reflect distinct shifts in her practice. It will feature in an exhibition on the artist in late 2018. Noŋgirrŋa Marawili was born around 1939 in north-eastern Arnhem Land. 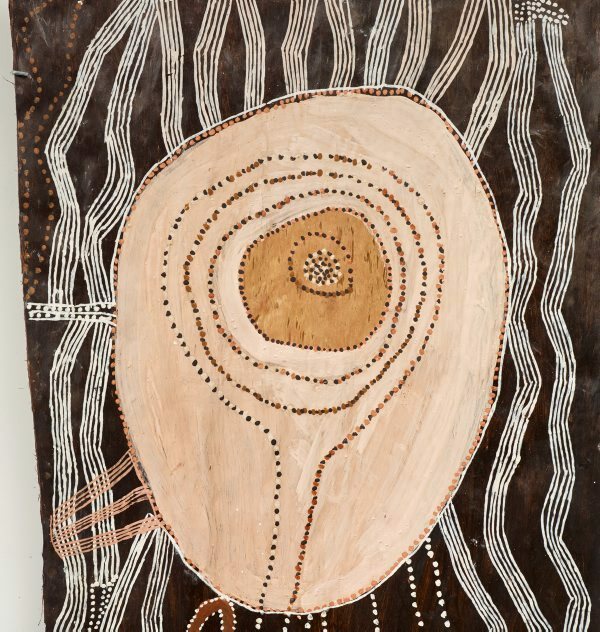 Her first bark paintings were produced in the early 1990s through the Buku-Larrŋgay Mulka centre, Yirrkala and her first prints through the Yirrkala Print space in 1998. Noŋgirrŋa has exhibited in numerous solo and group exhibitions in Australia and internationally and her works are held in numerous public collections, including the Metropolitan Museum of Art in New York. Noŋgirrŋa was a finalist in the National Aboriginal and Torres Strait Islander art awards in 1994, 1996, 1998, 2013, 2014, 2015 and 2017, winning the bark painting award in 2015. She has also been a finalist in the Arthur Guy memorial painting prize in 2013, the Western Australian Indigenous art awards 2015 and the Alice Prize 2018.